We proudly announce the first Raw Suppliers label releases! 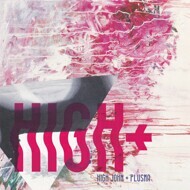 Hamburg based beatproducers and Raw Suppliers members Plusma and High John finally release their new collaboration "High+". This outstanding masterpiece is an excellent fusion of Plusmas progressive, almost genre defining sound and High Johns laidback and still experimental vibe. It brings tight drums, jazzy chords and creative melodies directly to your speakers making your furniture bounce. This album is an adventure from beginning to end, taking you above the clouds straight along the "high-way".